In 1993, Jeff Kletter's doctor made matters simple: shape up or die young. So, he hired Josie, a personal fitness trainer to coach him back to health. During their workouts, Jeff complained about his sore muscles and how pain relief products simply don't work. Josie joked, perhaps we should make a formula especially for him. And they did. It was and the birth of KINeSYS. With the strong chemistry between them, they quit their jobs, sold their belongings, and began a new partnership in business and in life. They recruited a chemist with 30 years experience to formulate a line of products designed to meet the rigors of professional athletes. Then worked with a team of leading sports medicine physicians, when one noted that athletes had a lower incidence of most diseases except one - skin cancer (due to prolonged outdoor exposure while training and competing). With this mind, KINeSYS created a new kind of "performance" sunscreen that provides high UV protection, is easy to apply and gentle enough for even the most sensitive skin, as it needs to be used regularly. The same suncare technology provided to elite athletes is now available for your active family. KINeSYS Performance Sunscreens are now the choice of professional athletes and families alike, regardless of skill or age. KINeSYS is the brand trusted most by those who care about their skin and their health. No matter what you have planned, KINeSYS is the sunscreen for everyday. KINeSYS Sunscreen - For the active individual who demands the highest performance from their sunscreen. Countless tests and trials have led to the KINeSYS line of Performance Sunscreens, which exceed the requirements of professional athletes and active individuals regardless of skill or age. This gives Jeff and Josie complete confidence when using KINeSYS on their family. KINeSYS products meet the high quality standards they have as new parents and will effectively satisfy the demands of any athlete. MICROSPRAY™ Application Fast Drying Without the need to rub. When applied as directed, this product will effectively absorb both UVA and UVB rays. This gentle non-irritating formula is ideal for children, sprays on easily and dries fast for little athletes on the go and comes in a bright fun package kids love. Allergy Information: No parabens, preservatives, nanoparticles, nuts, nut oil, gluten, dairy, egg, soy, sulphites or colourants have been added to these products. 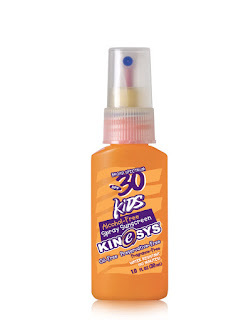 KINeSYS Kids SPF 30 Alcohol-Free Spray Sunscreen is great for kids and parents! I love that you can spray this on the kiddos and let it air dry. It's also great that there's no rubbing needed so both the kids and I are happy because the kids don't have to sit still for too long. They can quickly get out into the sun to play and with KINeSYS Kids SPF 30 Alcohol-Free Spray Sunscreen I know they are protected from the suns harsh rays. KINeSYS Kids SPF 30 Alcohol-Free Spray Sunscreen is also waterproof and free of many irritants in other sunscreens, making this a great product in my book. When applied as directed, this product will effectively absorb both UVA and UVB rays. This gentle non-irritating formula is an ideal choice for athletes or individuals requiring maximum sun protection during rigorous activity, with a lovely light mango fragrance. KINeSYS SPF 30 Alcohol-Free Spray Sunscreen with Mango is another great product. I love that this is alcohol free, hyper-allergenic and gluten free. The light mango fragrance smells wonderful and makes a day at the beach a little more fun. I also really like that KINeSYS SPF 30 Alcohol-Free Spray Sunscreen with Mango is broad spectrum ensuring you maximum protection from the suns harsh rays. 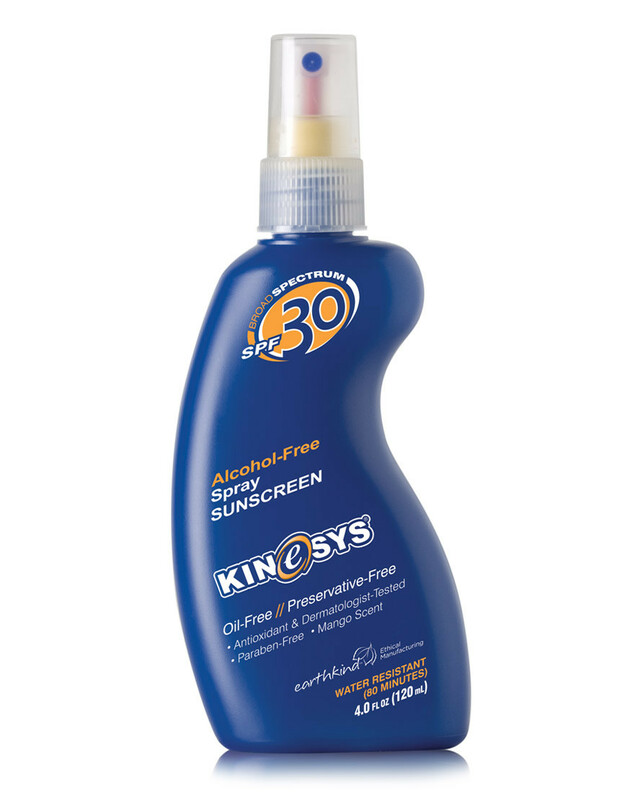 KINeSYS SPF 30 Alcohol-Free Spray Sunscreen with Mango is also waterproof and free from many irritating ingredients found in other sun screens. This is my go to sunscreen for a quick run because I can spray it on and go running without having to rub it in. I also love that because it's alcohol free it doesn't burn my eyes. KINeSYS SPF 30 Alcohol-Free Spray Sunscreen with Mango is a wonderful product and I highly recommend it! Follow KINeSYS on social media! It's always great to find new products to use, especially on children! Sunscreen has been such a tough one to find, too! Always in search of a good, less damaging sunscreen! Thank you for sharing! I love that this sun screen is Alcohol-Free. Alcohol is so damaging and drying to the skin. Sounds like a great product! This is a very interesting product! I love that you gave the history behind it before your review. :) What a neat story about how it started! I love the spray sunscreen. Runs out soooo fast though. Thanks for introducing me to a different brand. This sounds great! My husband got one heck of a sunburn from running last week! We burn easily in my family, so a good sunscreen is a must! !